Question: What does fragrant Sweet Basil have in common with the Basilisk lizard? 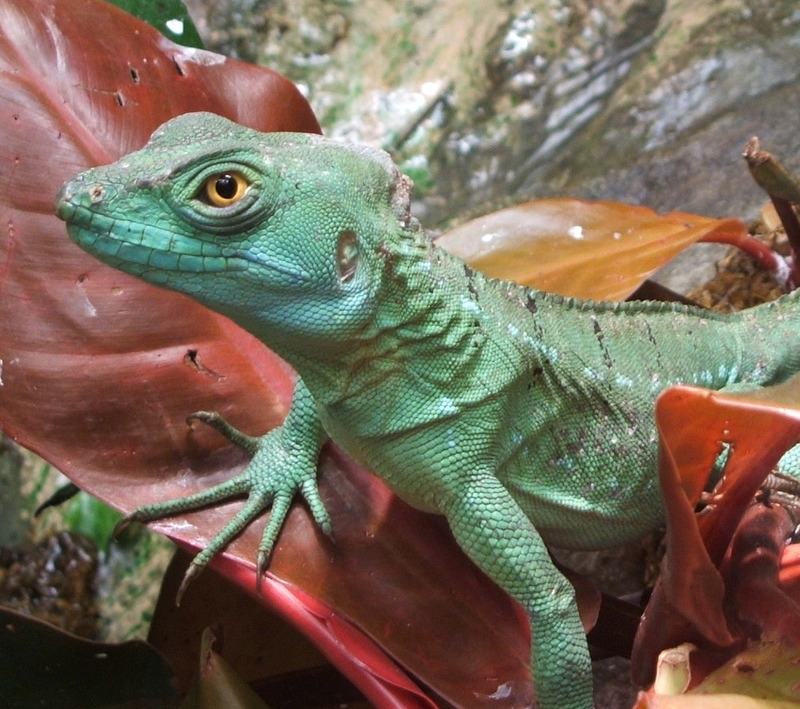 The Basilisk lizard, also known as the Jesus Christ lizard because of its ability to walk on water. 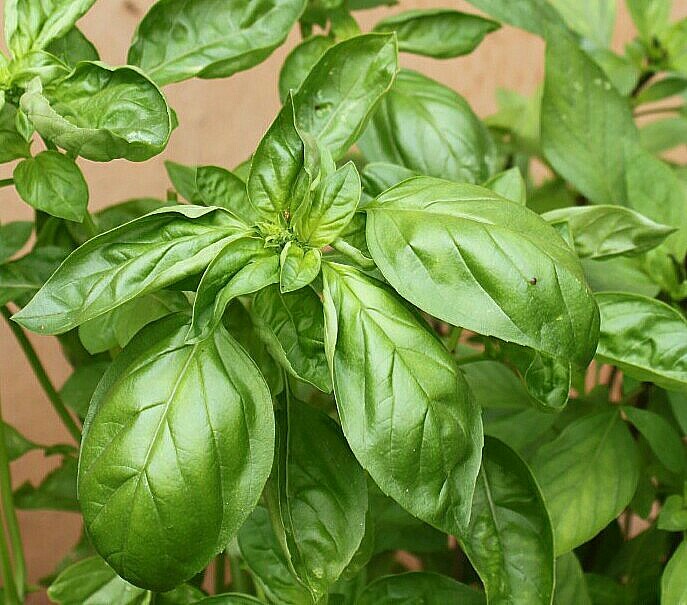 In Greek mythology the only magical cure for the fatal stare, breath, or bite of the creepy half-lizard, half-dragon basilisk, was a basil leaf. For the same reason, it was also heralded by the Romans. Another point on which they agreed was the importance of ranting and raving while planting out the very strongest basil seedlings. I have no idea why. And then the French being the French, they turned this odd tradition into language: semer le basilic, or sowing basil, which means to rant or slander or just let rip. Add to this the poem written by Chris’s favorite poet, John Keats, ‘Isabella, or The Pot of Basil’ in 1820, about a young woman who hides the head of her murdered lover in a pot she later fills with basil plants, and then you understand why the French tend to semer le basilic about the English and their abuse of culinary herbs. Sweet basil in a pot outside our kitchen (no hidden heads). Well, thank God for Sarah Raven is all I can say. This (very) English award-winning cook and gardener led me to one of the tastiest ice creams ever invented, a recipe inspired by the Amsterdam restaurant, De Kas. The ancient Egyptians and ancient Greeks, who believed that basil would open the gates of heaven for a person passing on, would not have been at all surprised to learn that, when I first tasted this ice cream, I saw heaven. Yield: About 4 liters/4 quarts of ice cream. 600g mascarpone cheese (this is not available in Livingstone, so I made a mixture of two-parts cream cheese to one-part mabisi, a local fermented sour milk). 2. Pour the mixture into an ice cream maker and churn for about 20 minutes. (I used the no-churn method, freezing the ice cream for a couple of hours and then breaking up the ice crystals with the whizzer stick, before refreezing it over night). 3. Either serve immediately if using an ice cream maker, or pack into plastic containers for the freezer (allow the ice cream to sit for 15 minutes in the fridge before serving). Note: This has a wonderful flavor if it is eaten as fresh as possible. Don’t store it for too long in the freezer. 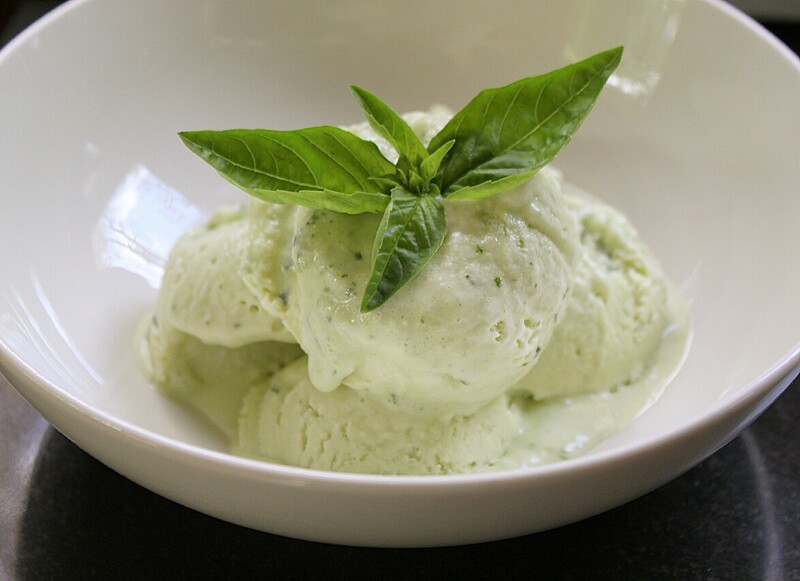 Basil Ice Cream (photographed in the ‘melting’ heat of a Zambezi Valley summer’s day). Thank you very much, Trudy! Hey, Jean-Pierre … I thought of you so much when I was writing this post! I love the French being the French, too. 🙂 The ice cream is delicious. Such a unique flavor and very more-ish! Hi Jan … I served this ice cream last weekend with pistachio florentines. It’s a delicious summer dessert. I’m not sure why your basil is bolting so quickly. Do you remove the flowers as soon as you see them emerge? So far basil has done well here, and as you know, it’s very hot! What a fascinating story about basil. Thanks Annabel…and another delicious recipe. Thank you, Hellie, for your interest. It was such a fun story to write. And yes, the ice cream really is delicious! I work in a French organisation and my colleagues love to semer le basilic at every meeting! Q’uelle surprise!